You are currently browsing the archives for the Election 2010 category. Prior to this op-ed, I thought that the Democrats most prone to delusion lived in fever swamps with Keith Ellison, Nancy Pelosi and Babs Boxer as neighbors. 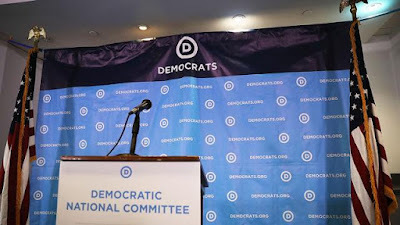 Thanks to Stan Greenberg’s op-ed, I have to consider the possibility that the entire Democratic Party is nuts. Greenberg’s op-ed starts by saying “President Obama will be remembered as a thoughtful and dignified president who led a scrupulously honest administration that achieved major changes.” I’d use lots of terms to describe the Obama administration but scrupulously honest isn’t one of them. Fast and Furious was the personification of dishonesty. Weaponizing the IRS to harass TEA Party organizations isn’t the picture of scrupulously honest, either. Unanimously getting shot down 13 straight times by the Supreme Court for his attempts at executive supremacy doesn’t say scrupulously honest. It says President Obama didn’t respect the rule of law. First, President Obama didn’t rescue “an economy in crisis.” TARP, passed during President Bush’s term, started the stabilization. The Federal Reserve’s Quantitative Easing, not President Obama’s stimulus, injected life into the economy. Pulling “America back from its military overreach” created ISIS, which is expanding its lethality each day. The American people aren’t stupid. They tried telling President Obama that they didn’t want Obamacare. He didn’t care. Ideology demanded that it be passed so the Democrats lied about it, then passed it. The next election, the American people threw a beat-down on the Democrats’ agenda. Still, President Obama wouldn’t listen. Eventually, he said he’d get things done with a pen and a phone. President Obama’s outright disrespect for the Constitution and the rule of law got people upset with Democrats. That’s why they’re on the outside looking in. Half of the states have a Republican governor and Republican legislatures. In DC, there’s a Republican waiting to be sworn in as the next president and Republican majorities in the House and Senate. That type of repudiation doesn’t happen to “thoughtful and dignified presidents.” It happens to despots who ignore the Constitution and the American people. That’s President Obama’s identity. Democrats didn’t lose 63 seats in the House in 2010 because their candidates performed poorly. They lost because they voted for the ACA. What happened in 2010 actually started in 2009. Democrats didn’t listen to their constituents. They listened to President Obama instead. Democrats didn’t listen to their constituents when they held their townhall meetings in August, 2009. It didn’t require a rocket scientist to notice that people were upset during their meetings. The people spoke. The politicians ignored the people. In November, 2010, the people spoke again. This time, they spoke with a loud, disapproving voice. They essentially told Democrats that they were getting punished because Democrats didn’t listen to We The People. Now in 2016, the people were heard again. They said that they don’t care about income inequality as much as they care about businesses creating good-paying middle class jobs. The people said they don’t care about transgender bathrooms in schools as much as they care about students getting a great education in school. We The People said that the EPA has gone too far and that it’s time to stop the EPA’s abusive behavior. From a structural standpoint, it’s wise to re-implement Howard Dean’s 50-state strategy. That won’t put Democrats back in control, though. That’s because Democrats have a huge millstone hanging around their neck. The name on that millstone is Obamacare. If Democrats don’t admit that Obamacare was a mistake to implement, they’ll wander through the desert for a long time. During a recent press conference in which he reiterated his support for a gasoline tax increase, Dayton mocked a GOP transportation proposal as “pure fantasy,” dismissing the plan’s funding mechanism as derived from “la la land” and “Fantasy Island.” Yet Dayton’s name-calling can’t change the fact that he’s long been an opponent of the very type of gas tax increase that he’s now pushing. “I don’t support a gas tax. I don’t think the people of Minnesota are prepared to support it and that’s the critical consideration,” Dayton assured Minnesotans in 2013. “If it’s going to raise more revenues than the current gas tax, then it’s going to result in higher fuel prices for middle-income Minnesotans. I think they’re not in a position economically to have that,” Dayton emphasized that same year. During his 2014 re-election campaign, Dayton again expressed opposition to a gas tax increase. “I have thought all along that this requires a long discussion in a non-election year,” Dayton stated. It’s time for Gov. Dayton to stop with his flip-flopping. Gov. Dayton and the DFL didn’t promise to raise taxes during the campaign. In fact, they tried claiming that repealing their tax increase from 2013 was a tax cut. Gov. Dayton and the DFL promised voters property tax relief. I wrote this post and this post to show that the DFL failed with that promise. There’s no question that Gov. Dayton and the DFL prefer a progressive income tax system. Likewise, there’s no doubt that Gov. Dayton and the DFL like raising regressive taxes, too. Their record is littered with proof of the DFL voting for progressive and regressive taxes. 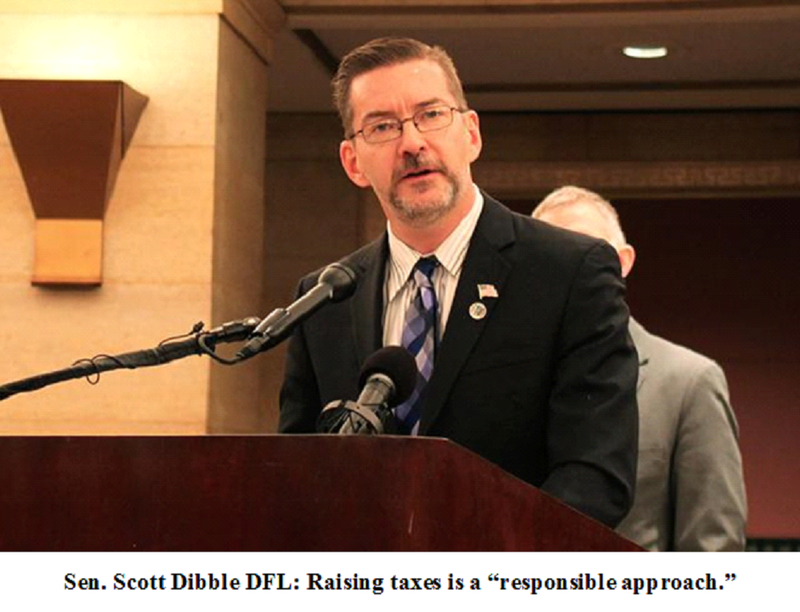 Tax the rich is the DFL’s mantra but tax everyone is what the DFL believes in. The DFL just isn’t honest enough to admit the latter in public. Tax, tax, tax, tax, tax, tax, tax. That’s the DFL’s solution for everything. In 2013, they raised taxes and fees by $2,400,000,000. In 2014, they repealed some of the taxes they’d raised in 2013, then had the audacity to call it a tax cut. FYI- That didn’t fly with voters. They returned Republicans to the majority in the Minnesota House of Representatives. With the 2015 session just a week old, the Senate DFL has proposed raising taxes to fund their transportation wish list. Let’s be clear about this. Republicans want to focus on fixing roads and bridges. The DFL wants to raises a plethora of taxes to repair roads and bridges, pay for trolley cars, fund transit expansion and pay for light rail projects. Republicans a) don’t want to raise taxes and b) want to focus on roads and bridges. The DFL wants to raise the gas tax (even though it won’t fund the projects they’re proposing) to fix roads and bridges and increase license tabs and the metro sales tax to pay for transit projects. In 2010, Mark Dayton criticized Tom Horner for pushing a cigarette tax increase, calling it a regressive tax. At the time, Gov. Dayton said Minnesota needed a more progressive tax system. Back then, Gov. Dayton said that he’d “tax the rich” but he’d cut taxes for the middle class. There’s now a plethora of proof that Gov. Dayton lied. BIGTIME. The rich got hit alright. Unfortunately for the middle class and the working poor, they’ve gotten hit the hardest with the Dayton-DFL tax and fee increases. Minnesota’s middle class and working poor can’t afford the DFL’s tax increases. They’re taxed too much already. Halbig v. Burwell: What if? What leeway does the ACA itself give the administration? It seems self-evident that the states currently using the federal exchange would be required to do something, to “establish” their own exchanges, and the Health and Human Services Department therefore couldn’t just decree that all exchanges are state-based. States also probably need to do more than, say, sign a piece of paper declaring their exchange state-based. An Exchange shall be a governmental agency or nonprofit entity that is established by a State. “If that were to be the case, I would assume that you could have a mulligan here, a major do-over of the whole thing,” he said, in comments flagged by the Washington Post’s Greg Sargent. While the administration might be willing to do a lot to save the law, an emboldened Republican Congress seems unlikely to settle for anything less than major concessions, as McConnell suggests. So a fix in Washington doesn’t appear in the cards. It’s interesting that Democrats fear a Washington fix because that would require them making major concessions in exchange for those subsidies. In other words, DC Democrats are most afraid of actually improving the ACA. That’s insane on a multitude of fronts, starting with the fact that the ACA is a weighty millstone around their political necks. Democrats got crushed in 2010 and 2014 because of the ACA. Despite experiencing those historical thumpings, Democrats don’t want to change the ACA. It’s their right to commit political suicide. So, when Gov. Mark Dayton and Democratic leaders recently declared their one-party control led to the state making good on $2.5 billion in delayed K-12 school payments, we stopped dead in our tracks, totally astonished. Now, people who know us gather we are reasonable people. We don’t like to get into partisan politics, but in this instance, we felt the need to set the record straight to what we view as one of the more egregious examples of political misrepresentation. Governor Mark Dayton, Senate Majority Leader Tom Bakk, House Speaker Paul Thissen, Management and Budget Commissioner Jim Schowalter, and Education Commissioner Brenda Cassellius announced that Minnesota schools were repaid an additional $636 million at the end of the 2013 fiscal year. The budget that was in place through the end of FY2013 was passed by the GOP legislature after a lengthy shutdown caused by Gov. Dayton. Credit for paying off $636,000,000 of the school shift rightly belongs to the GOP legislature, first because their budget created a healthy surplus and secondly, because the GOP legislature said no to the greedy fingers of the DFL’s special interests. From the previous Legislature, we inherited a $5 billion deficit, including a $2 billion school shift. A “shift” simply means that payments to K-12 schools are delayed to a later date in order to provide a one-time savings to the state without actually reducing education appropriations. As we wrestled to balance a historic deficit and out-of-control spending, we and our legislative colleagues called for holding the line on taxes and controlling state spending; on the other hand, Dayton called for large tax increases to fix the deficit. During compromise negotiations, Dayton was first to float the idea of delaying school payments to an even later date. Ultimately, as part of the 2011 budget agreement with the governor, the amount owed in deferred payments to schools grew to $2.7 billion. In other words, the DFL had little, if anything, to do with accelerating the paying off of the school shift. Rep. Thissen didn’t vote for the budget Gov. Dayton grudgingly signed. Sen. Bakk didn’t vote for the budget that Gov. Dayton grudgingly signed, either. Hardworking Minnesotans responded well to the budget that didn’t tax them, and revenues coming in to the state were consistently higher than expected. Record numbers of businesses popped up, and the unemployment rate continued to drop. Vetoing a bill that would’ve paid off the vast majority of the school shift, then taking credit for paying off the school shift with the money from a budget they didn’t want belongs in the theater of the absurd. It’s pathetically fitting that Democrats would take credit for something they didn’t want anything to do with. By this point, the 2011 fiscally responsible budget had produced nearly $3.4 billion in cumulative budget surpluses. Of this, about $2.5 billion has been applied to the school shift, leaving only about $238 million from the 2010 DFL-led Legislature. During the 2013 session, our DFL colleagues enacted a special provision that allowed them to use the remaining budget surplus of $636 million and put it toward the remaining school shift. Now, Gov. Dayton and legislative leaders who decried the 2011 budget are taking credit for its benefits. We have to admit, it’s a shrewd move and politically savvy. But it’s not honest. The words honesty and Democrats fit together as nicely as ‘government shutdown’ and ‘respectful of veterans’. Gov. Dayton and the Democratic legislature fought against paying off the school shift. Democratic legislators voted in lockstep against the GOP to repay the shift. Gov. Dayton vetoed the bill that would’ve paid off $2,500,000,000 of the school shift. Those are verifiable, irrefutable facts. Gov. Dayton and the Democratic legislature should be ashamed of lying this blatantly about who paid off the school shift. UPDATE: Sen. Nienow just emailed me this clip from this September’s special session. In the video, Sen. Bakk admits that the school shift wasn’t in the DFL’s budget. Further, Sen. Bakk made clear that paying off the final $238,000,000 would rely on whether sufficient revenues came in. Finally, Sen. Bakk sounded anything but clear on whether there was enough money to repeal the DFL’s mistake taxes, aka the B2B sales taxes on farm equipment repairs, telecommunications purchases and the warehousing services sales tax.